8K resolution features four times more pixels than a 4K UHD TV and 16 times more pixels than a full HD TV. The result? 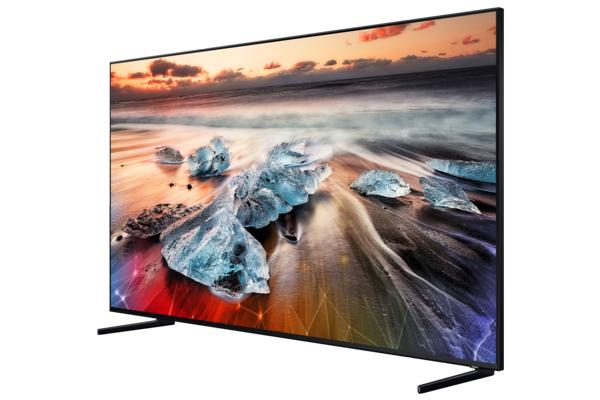 A spectacular picture which pushes the envelope of technology, with unrivalled detail and sharpness at any viewing distance, and uncompromised by screen size across the range of 65-inch, 75-inch and colossal 82-inch models. AI Upscaling with the power of dynamic machine learning helps to enhance content while Direct Full Array Elite technology improves contrast and precisely controls backlighting. While currently there is limited native 8K content available, the Samsung proprietary 8K Quantum Processor recognises and calibrates lower-resolution sources, whether it’s from a streaming service, set-top box, HDMI, USB or even mobile - resulting in Samsung’s most powerful TV to date. The QLED 8K also integrates HDR10+ and Ultra Bright III to manage the TV’s contrast and colour. Brightness levels are optimised to help ensure content is displayed sublimely and consistently in almost any lighting conditions while HDR10+ also minimises the impact of glare and reflection in New Zealand’s many sun-filled rooms. Connected home ready, One Remote ensures quick and convenient access to compatible devices and services including Netflix™, YouTube™, Xbox™ and compatible soundbars. Each model also comes equipped with smart capabilities for Samsung’s Smart Things and Bixby as well as integration with voice-recognition based platforms Amazon ‘Alexa’™ and ‘Google Assistant’™, so users can turn their TV on or off, or control volume via simple voice commands. The new line-up will also support the soon to be launched Apple TV™ and Apple AirPlay 2™. Samsung’s 2019 range of televisions will also be the first in the country to have the new Spark Sport Smart TV app in-built, giving Kiwis the latest sports streaming service directly through a bespoke app on their TV.